It’s the last weekend before Christmas which means you have just a few more days to enjoy the holiday spirit in Loudoun. Take a horse drawn carriage through the Village at Leesburg or enjoy a delicious brunch with Santa and his elves at Salamander Resort. Interested in tasting cider from a local micro-cidery? Visit the new Wild Hare Cider location in the Leesburg Marketplace! Whatever you do this weekend, we hope you enjoy it! Be sure to use #LoveLoudoun to show us your fun. Merry Christmas & Happy Holidays! 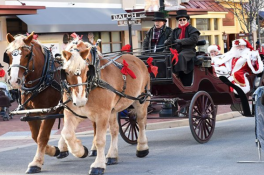 For a memorable holiday tradition, head to the Villages at Leesburg to take a Horse Drawn Carriage Ride through the shops and restaurants of the town center. Now through December 23rd, this fun happening is available for free! This is an experience you don’t want to miss and we guarantee your loved ones will appreciate this special treat! After taking a ride through the village, be sure to stop for a photo op at the spectacular Christmas tree. A final stop for dinner at one of the 20+ restaurants will be just the icing on the cake to a fun-filled holiday experience! You’ll be your child’s favorite if you take them to Brunch with Santa at Salamander Resort this Saturday, December 23rd! Santa and his elves will be joining you for a delicious breakfast featuring sweet and savory favorites. Plenty of photo ops will be available as your child creates their own holiday keepsake in the beautiful winter wonderland! You must RSVP for this event. 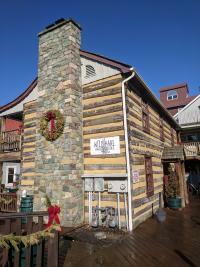 Formerly located in Bluemont, Virginia, Wild Hare Cider is now open in the Leesburg Marketplace. Wild Hare is a boutique, micro-cidery that grows their own orchard in the heart of Shenandoah Valley. Using a slow fermentation technique, this cider is not conventional or too sweet. Although open in Leesburg, the cidery is keeping their current 3,200 square foot warehouse space in Berryville where some of the production takes place. Come out to Leesburg Marketplace to get a taste of Wild Hare Cider! They’re open Thursday & Friday 12-5 & Saturday 12-6.